Make the right cloud ERP purchase for your midsize company. 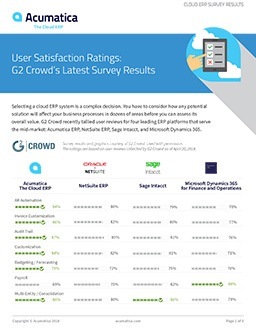 This survey report reveals what users really think about Acumatica and three competing cloud or on-premises ERP platforms. Considering a cloud ERP purchase? Then you’ve probably done extensive research into what each vendor can provide. But how satisfied are Acumatica, NetSuite, Sage, and Microsoft Dynamics 365 users with the features they’re accessing in the cloud each day? Find out in a new user survey report from G2 Crowd. How the leading platforms compare across 26 key categories. In which 16 categories Acumatica leads the pack in user satisfaction. Which core accounting features Acumatica is dominating. Which features are equally strong across ERP platforms. Which platforms are headed in the right direction—and which are playing catch-up. With this valuable user survey data, you’ll be able to make your next ERP purchase with confidence. Download the report now! Get free G2 Crowd survey results! Acumatica's main competitive differentiator for expanding SaaS capabilities lies in their integration strategy that is part of their platform described by Roskill as a 'multi-cloud strategy.' We agree that there is a benefit gained from stitching together disparate functionality into an application from a variety of internal and external cloud services. Already, few of the pre-configured integrations include Salesforce, Office 365 and DocuSign, leading providers in their markets, which will give customers an accelerated path towards process efficiencies.